OKLAHOMA CITY – Terracon, a leading provider of environmental, facilities, geotechnical, and materials services, has partnered with the Oklahoma State Department of Education (OSDE) to launch a pilot program that places committed teachers into paid externships in science, technology, engineering, and math (STEM) fields. The goal of the program is to provide a professional development opportunity that gives teachers skills and insights to better craft curriculum and inspire students to consider careers in STEM fields. Interested teachers completed an application and chose an externship term, either July 10 – 21, or July 24 – August 4. “Terracon has always been committed to educating and hiring quality engineers and scientists. In order to have more scientists and engineers in the workforce, we as a scientific community need to promote, excite, and inform both teachers and students to encourage interest in these fields,” said Phil Wood, P.E., senior principal and regional manager for Terracon in Oklahoma City. Wood explained that by providing the externships, Terracon is helping a few teachers, but more importantly, setting a precedent for other companies to proactively reach out to students and teachers. 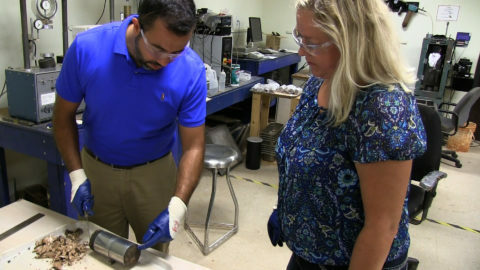 Two teachers from the middle school through high school levels work at the lab and offices of Terracon’s Oklahoma City location during each externship term. The teachers shadow Terracon employees and even conduct their own testing and sampling of soil samples, for example. The idea for the summer teacher externship grew from conversations Wood had with Robyn Miller, Ed.D., who is deputy superintendent for educator effectiveness and policy research with the OSDE. They discussed the need for teachers of STEM-related subjects to understand what is involved in working in a scientific or engineering business. To address that issue, Miller said the OSDE prepared a toolkit including an externship application, sample schedule, suggested compensation and the applicability of the externship in these teachers’ classrooms. “From this experience – which we hope will inspire other businesses to establish similar externship programs — teachers will be better able to expose their students to STEM-related fields and help them achieve their aspirations for the future,” Miller said. The partnership between Terracon and OSDE will potentially be used as a template for future professional development models to help teachers gain firsthand knowledge of how companies are using the engineering design process and 21st century skills to be competitive in the workforce. Terracon is an employee-owned consulting engineering firm with more than 4,000 employees providing environmental, facilities, geotechnical, and materials services from more than 140 offices with services available in all 50 states. Terracon currently ranks 30th on Engineering News-Record’s list of the Top 500 Design Firms. For additional information about Terracon, visit www.terracon.com.